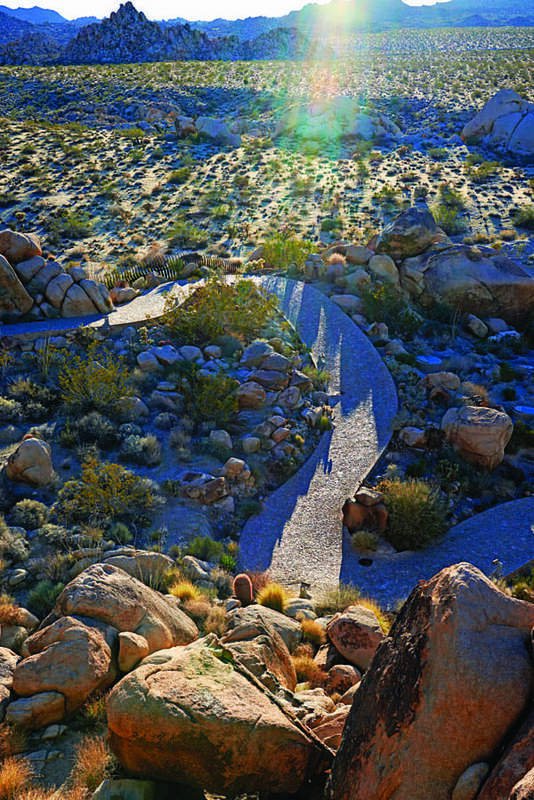 It’d be easier to lasso the wind than to find words for Jay and Bev Doolittle’s house in Joshua Tree. Here’s a try: A circle of concrete columns, like a palm oasis, shoot upward from bedrock, twisting and turning until they flare into canopies over our heads. The activity in the home’s interior flows around existing, on-site boulders, similar to the way water in a stream flows around rocks. Oh, forget it. 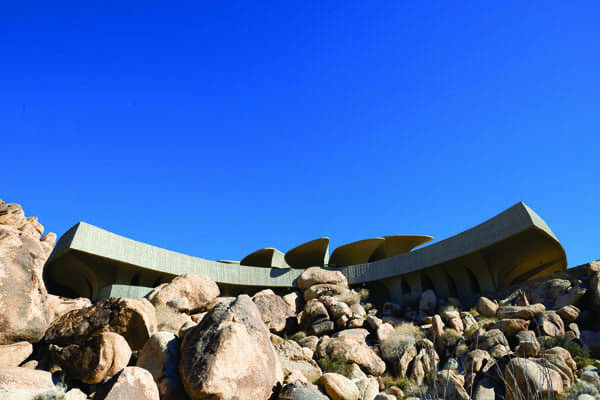 This masterwork by San Diego–based architect Kendrick Bangs Kellogg cannot be captured adequately in either prose or pictures. The Doolittles’ home — which is coming on the market after 27 years of construction, elaboration, and tinkering — must be experienced, meditated on, and savored over time. Even if the Joshua Tree House had no architectural interest, the view alone would make the hilltop dwelling a destination. But Kellogg’s building is awash in interest. From the road, the front balcony sits low on the rocky cairn, almost menacingly, like the giant in Disney’s Night on Bald Mountain, ready to spring up and scare the bejesus out of us at any moment. The pathway to the front entrance is steep and paved in natural stone, as is much of the floor on the interior — which could be likened to a group of freestanding concrete trees with lots of air between them. Technically, these “trees” are 26 concrete piers, each supported by bedrock beneath the house. Windows set at unconventional angles fill in the irregular gaps between the twisty-turny columns while letting in plentiful natural light. Rising from the floor, the windows continue without interruption into the ceiling. With windows set at all angles, it’s not surprising that the owners find themselves aware of the sun and its shifting position throughout the day. At night, meanwhile, “There’s enough moonlight in the master bedroom to walk around without turning on a light,” says Jay Doolittle, who started building the house in 1987 with his wife, Bev. Great buildings require both exceptional clients and gifted architects. The Doolittles seem to have been born to be clients for Kellogg. The couple, who live with their adult son, Jayson, met in art school, and both have pursued careers as painters. With the intention of building his dream home, Jay bought 10 acres of rocky land from his father in the 1970s. Then the question arose: What kind of house should they build? The answer came while the couple was browsing in a Palm Springs bookstore in the mid-1980s. Jay saw a project by Kellogg in a magazine devoted to organic architecture. 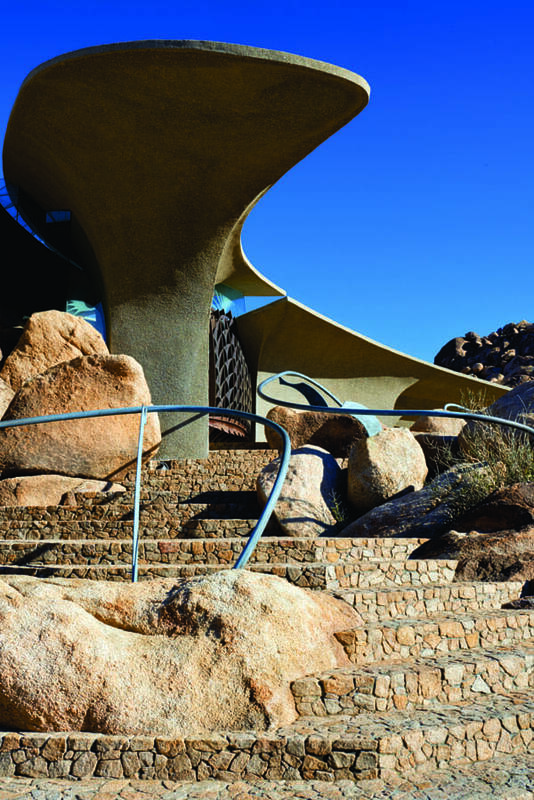 They set out to find the architect, best known locally for the now-demolished Chart House restaurant in Rancho Mirage. 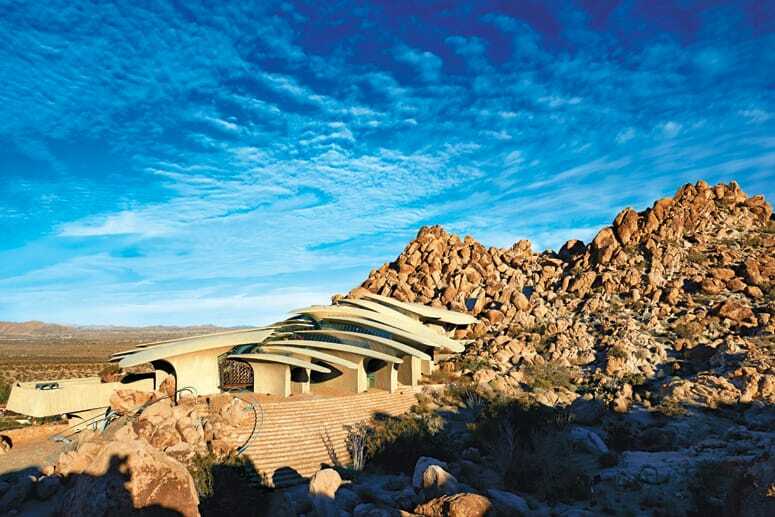 Born in 1934, Kellogg is a champion of organic architecture, which claims Frank Lloyd Wright as inspiration and the latter’s belief in one-of-a-kind buildings in the service of beauty, the landscape, and untrammeled self-expression. 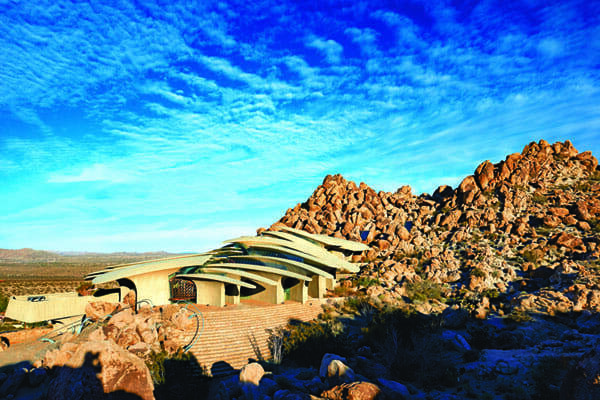 Although Kellogg did not study with Wright, he did meet the master in 1955 at Taliesin West in Arizona, and that was apparently enough of a jolt. Design was a slow and methodical process. The terrain was so irregular that Kellogg commissioned aerial photography and had new topographic maps prepared. After building a three-dimensional version of the map in Styrofoam, the architect went back and forth between the site — tape measure in hand — and the model. “It took me three months to come up with the idea,” he says. Construction also proceeded slowly, with workers using a golf cart and a small Kubota tractor to haul building materials; the pathway leading to the construction site was too narrow for conventional equipment. The Doolittles, who lived down the street while the house was going up, waited nearly 15 years to occupy the structure. Craftsman John Vugrin might be considered a collaborator in the making of the Joshua Tree House, along with the clients and the architect. The house is full of one-of-a-kind objects, all handmade by Vugrin — a quiet, unpresuming man who trained originally as an artist and has been working with Kellogg since Vugrin was a teenager. 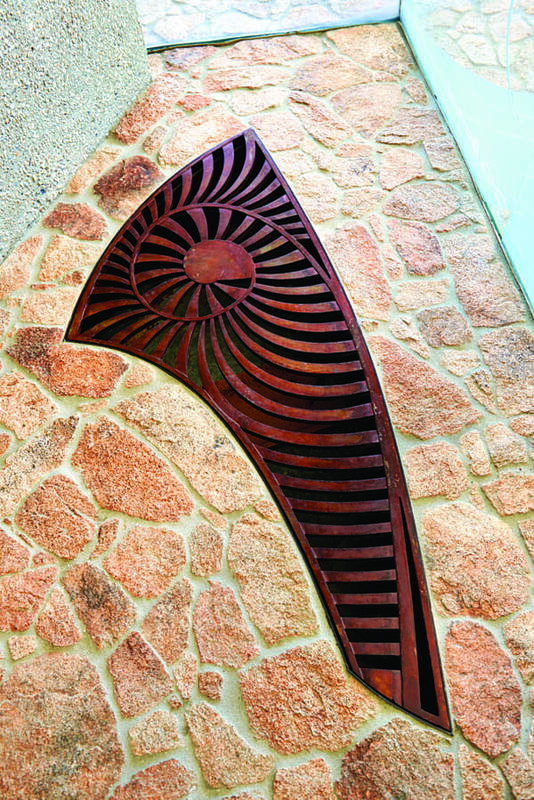 Vugrin has spent much of two decades carving Honduras mahogany, bending metal, and carving granite and marble. In one bathroom, a rosy marble sink originates in the ceiling and moves diagonally to the height where we can wash our hands. In the small dining room, he has designed and executed a kind of glass parasol over the room, using 800 pieces of sandblasted glass. The perimeter fence is also a work of art, consisting of vertical strips of steel with dangerous-looking scalloped edges. The same scalloped edges also adorn the front door, a combination of sandblasted glass and metal. Kellogg says he likes the natural rust color of the metal. “I’m a purist,” he says. Elsewhere in the house, a freestanding sink in bronze takes on the gargoyle-like distortions of sci-fi artists such as H.R. Giger. For all the flamboyance and daring of the house, a sense of relaxation and reflection prevails inside. The deep quiet is interrupted only occasionally by the sound of a refrigerator. 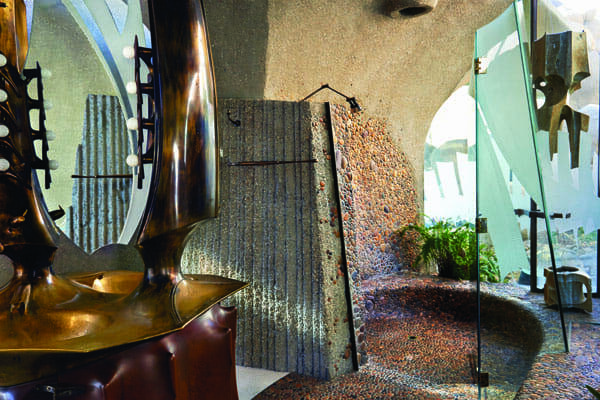 Natural materials and organic forms abound at the Joshua Tree House, as depicted here in the master bathroom, second bedroom, and various custom-made decorative details. Native stone on the home’s ground level echoes the landscape outdoors. Meanwhile, natural lighting bathes the space overhead while the furniture mimics the flowing geometry of the floor, wall, and ceiling. Inspired by the works of Frank Lloyd Wright and constructed of concrete, the Doolittle house melds effortlessly into its sunbaked environs. Nestled amongst boulders, the columns and curved canopies evoke an organic quality, as if growing out of the earth. Between the canopies, natural light streams into the house. 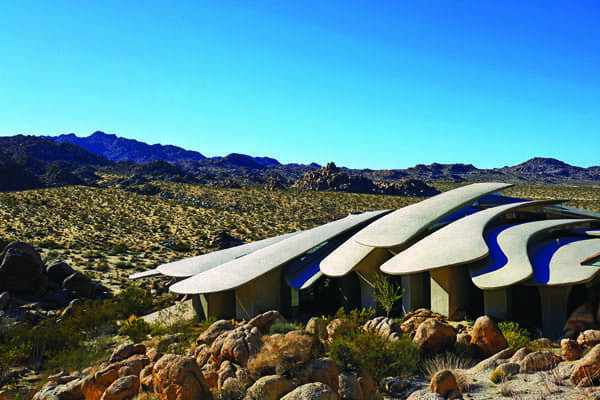 The Joshua Tree House, an example of organic architecture, is nestled into a rocky hill in the Mojave Desert. Again, the structure’s forms, colors, and shapes blend with the surrounding landscape. Details throughout the home, such as this one, recall the high desert’s prehistoric past. John Vugrin custom-crafted the home’s decorative elements over the course of nearly 20 years. Clerestory windows between the roof canopies provide views of the sky and surrounding landscape throughout the home, as shown here in the master bedroom. 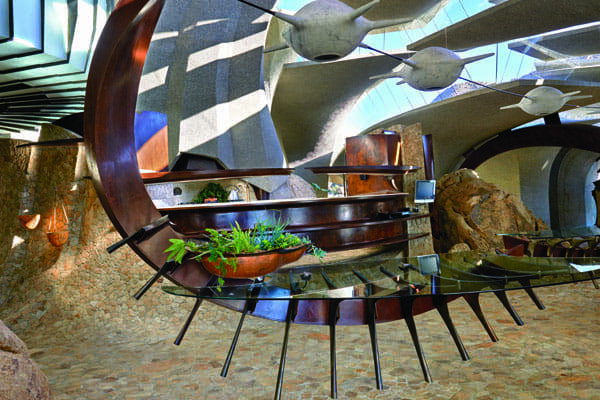 The curvaceous ribcage roof evokes the fossilized remains of a massive prehistoric creature from the Jurassic period. Concrete columns were integral in the home’s construction, passively acting to cool and heat the space. 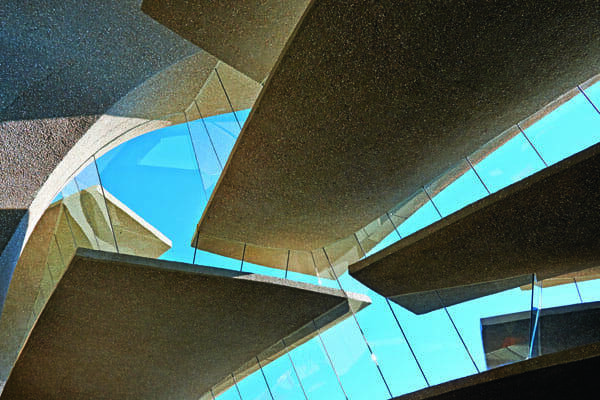 During the day, the concrete absorbs the heat of the sun and at night radiates the stored heat. Inside, the living space is essentially one, with areas carved out for eating, cooking, sleeping, working, and relaxing.